Hey, guys! Welcome to the ninth installment of my “Absolute Fretboard Mastery” series. Today’s lesson is a very exciting one because we’re finally going to start putting together everything we’ve learned over the past eight months into making great music on the guitar. If this is the first time you’re checking out the series, I suggest you hold off on this lesson and get started from the beginning. You can find parts 1 through 8 of this series right here. When I was starting out as a guitar player, it took me a while to understand the ultimate purpose of playing guitar. During those early years, I had some chops and I knew some theory, but my playing felt like it lacked purpose. That’s because it took me a while to understand that the ultimate purpose of playing guitar, at least to me, was to make the instrument an extension of your own self. In the same way a painter uses a brush and a canvas to express what he sees in his mind’s eye, a guitarist should be able to express what he hears in his mind’s ear through his instrument, fluently and freely. In that sense, the various scale theories, chord theories and playing techniques we’ve covered over the last eight months are a guitarist’s color palette and brush strokes. Over the rest of the year, we’re going to learn how to put everything we’ve learned so far to paint our musical pictures. For example, if you decide to jam in a specific key, there are various musical directions you could choose from, ranging from a chunky heavy metal riff or a bluesy guitar solo. But to express these musical ideas, you would need to be familiar with the various scales, expansions, chord progressions and shapes we’ve spoken about over the last eight lessons. If you’ve followed this series, you’ll remember our practice of “meandering” on these various scale patterns we've learned. If you've worked on your “meandering,” it should have gone a long way toward helping you visualize these scales across your fretboard. But the thing with meandering is that it alone doesn't add much musicality to your playing. Once you can see your G major pentatonic and diatonic scales as well as the G major chords across the fretboard, you can layer them together, if you will, instead of simple playing up or down a scale or an arpeggio. If, for instance, while your rhythm plays a G major chord, you can utilize the notes in any of the five shapes of G major according to the CAGED system along with the notes in the pentatonic or diatonic scale to “meander” with and create melodic phrases. Then you’d be able to identify your E minor pentatonic and diatonic scales across your fretboard and then entwine those notes with the notes in the various E minor chords to create melody. I call this style of playing "chord chasing," and you can do it with any chord you encounter during your playing and composition. Say you were jamming over a chord progression of G, E minor, C and D; the first thing you’d do is identify that you were playing in the key of G major. Then it’s simply a matter of deciding what scale to use and then understanding which notes to emphasize on at specific points. 03.Creativity: Making what we play sound musical. It’s this last aspect of creativity that I want to work on over the rest of the year. What I want you to do this month is to take a simple chord progression like G, E minor, C, D, and work on this style of chord chasing where you layer your scales with the CAGED chord system. But remember, this doesn’t mean you should religiously follow each and every chord while playing. For instance, you could add a little lick or riff here and there, which doesn’t necessarily fall inside this specific theory. The point is to start understanding the fretboard with these visual layers and also get a feel for navigating the fretboard with theory and musicality. 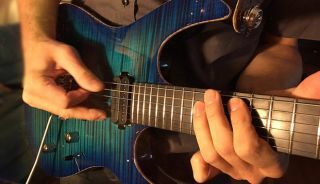 As always, if your technical ability interferes with this exploration of the fretboard — say, for instance, you can’t speed pick or you can’t sweep pick — work on those things simultaneously. Next month I want to get into what goes through a guitar player’s mind when soloing. That’s going to be a very interesting lesson! Practice hard as always and feel free to get in touch with me with whatever questions you might have at Lessonface.com. Steve Stine is a longtime and sought-after guitar teacher who is professor of Modern Guitar Studies at North Dakota State University. Over the last 30 years, he has taught thousands of students, including established touring musicians, and released numerous video guitar lesson courses via established publishers. A resident of Fargo, North Dakota, today he is more accessible than ever before through the convenience of live online guitar lessons at Lessonface.com.